I just had an email from an old friend, in fact one of my very first cooking school students, who told me she was still enthusiastically preparing artichokes the way I taught her 20 years ago. I was so thrilled to hear from her that I decided to devote this post to this prickly and intimidating member of the thistle family. I absolutely adore this vegetable and prepare it in many different ways – in a pie, in lasagne, risotto, with pasta, braised or preserved with in oil. I put sliced artichokes in frittate and in lamb or chicken tajines, either alone or with tender green peas or new season’s broad beans. They are simply delicious no matter how you prepare them. It is thought that the artichoke (and its close relative the cardoon) originated in North Africa where it still grows wild. The chokes of the wild artichoke thistle are dried and used as vegetable rennet to curdle milk – making one of the great breakfast treats in Morocco – “raib” – a type of set junket flavoured with orange blossom water and ever so slightly sweetened. 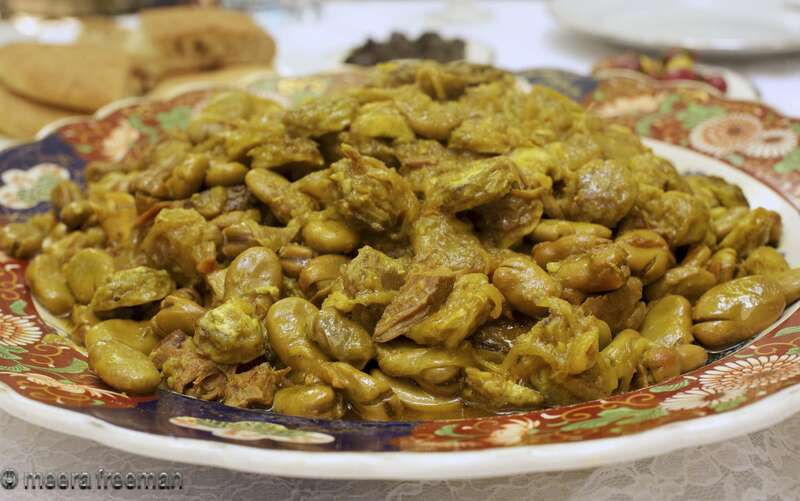 On my tour to Morocco last November, I requested a tajine of lamb with wild artichoke hearts and broadbeans. Lalla Fatima, the wonderful cook who welcomes my groups into her home, prepared it for us showing me the cuts on her hands (just in case I hadn’t quite appreciated the trouble she had gone to). The hearts were half the size of a broad bean and so sweet and succulent – a rare treat! Italians and particularly Romans are known for their artichoke dishes, among the best known of which are Carciofi alla Romana (braised artichokes) and Carciofi alla Giudea – flattened and deep fried whole artichokes of the large, round Mammola variety native to the Lazio region of Italy (a very old recipe particular to Rome’s ancient Jewish community and still available in the ghetto). 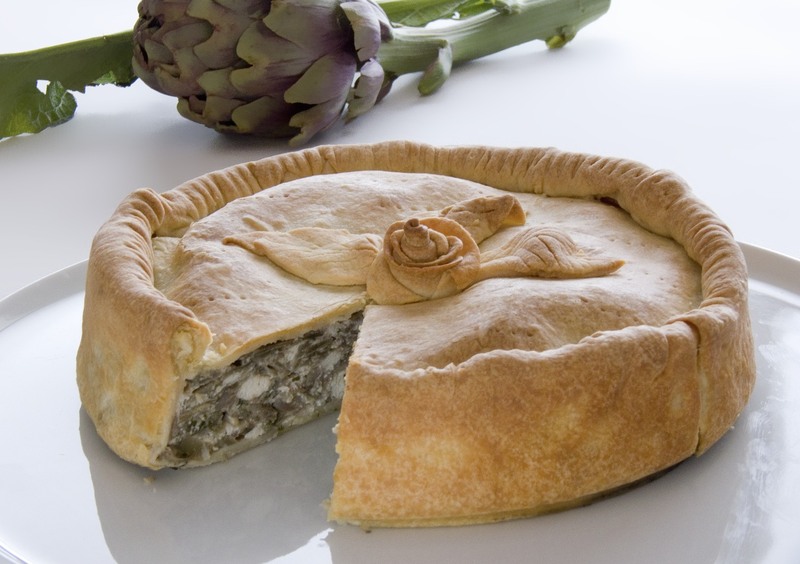 One of my favourite artichoke recipes is the following pie, adapted from a recipe by Marcella Hazan. 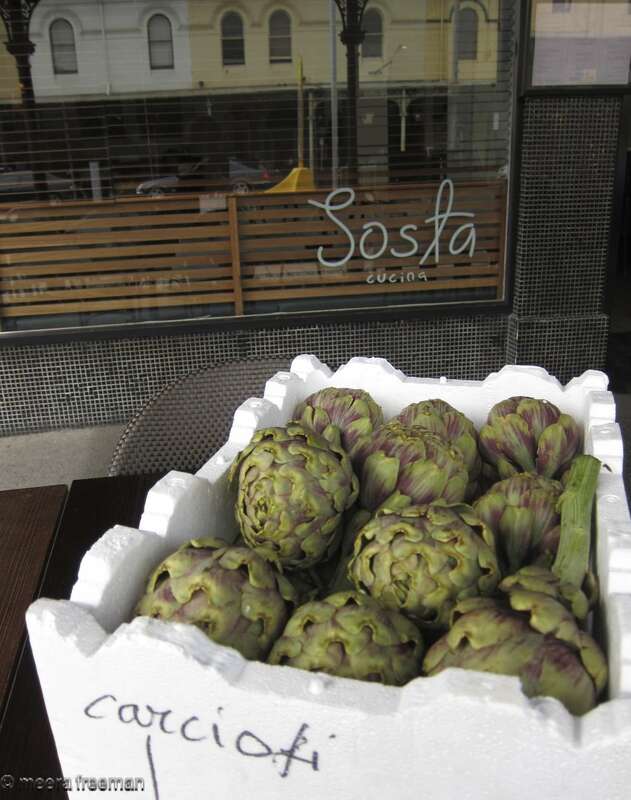 To prepare artichokes for cooking, follow these step by step instructions. (Sorry the explanation is in Italian but the video is self explanatory). In a food processor, sift the flour and then add the butter and process until mixture resembles coarse crumbs. Add the ricotta and salt and process until a soft dough is formed. Clean the artichokes and slice thinly, placing in a bowl of water acidulated with the lemon juice and a large pinch of flour to prevent them from blackening. Place the butter and onion in a pan and saute gently until the onion is soft and pale gold. Rinse and drain the artichoke pieces and add them to the pan tossing to coat with the butter. Add salt, pepper, half the chopped parsley and 1/2 cup water. Cover the pan and cook until the artichokes are tender (about 10 minutes). Boil away any liquid remaining in the pan and set aside to cool. Mix in the ricotta, parmesan, remaining parsley, marjoram and the beaten eggs. Check for seasoning. Divide the dough into two pieces, one twice the size of the other. Place the prepared filling into the tin and then roll out the second piece of dough placing it over of the filling. Seal the two layers of dough together, trimming off the excess and pinching to form a crimped edge. Make a steam hole in the centre of the top crust and decorate with leaves cut from the dough trimmings (I usually form some dough into a rose as well). Bake for about 45 minutes or until golden brown. Remove from the tin and set aside to cool. Serve lukewarm or at room temperature. I looked at that Marcella Hazan recipe just yesterday and thought it would be delicious. I’ll have to make it now! Amazing lovely Polly… go for it! I have changed and adapted it over the years and it is now a firm favourite! Let me know how it turns out.